Large capacity, well constructed - looks good too! Heats up very fast, and impressed our testers. Might not suit traditional or older looking kitchens. Can get a little hot on the outside during use - not enough to burn you though. 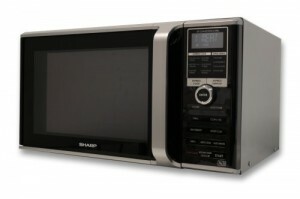 The 26 litre Sharp R890SLM is a mid sized combi microwave finished in a sleek silver exterior. It's ideal for medium sized families and households who are looking for a reasonable sized combination microwave, which is powerful enough to be practical, and compact yet still large enough to accommodate for larger dishes. In terms of design, it is very modern, finished in silver and black, with clearly labelled controls, as well as numerous auto cook menus to save you time. Granted, this combi model might not suit older kitchens, but for all other styles it should fit right in. In terms of performance, we simply can't fault the R890SLM - it cooks beautifully, and fast too - our testers were unanimously in praise of this model. The interior is stainless steel, which wipes clean easily and effectively, and the turntable features a 32.5cm diameter, which accommodated all of the larger dishes we tried. So what did we think overall about the Sharp R890SLM? 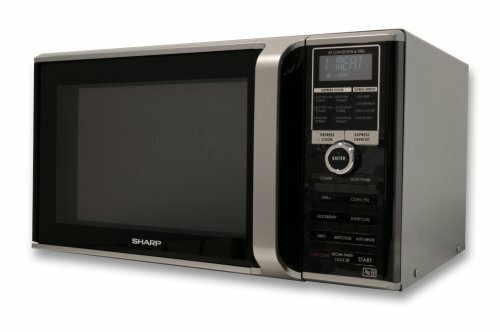 Overall the Sharp R890SLM is a very well constructed combi microwave which provides a spacious interior (26 litres) together with excellent performance. It looks great, with a sleek modern finish, and overall our testers were incredibly impressed - it performs as well as rival microwaves costing twice as much. If you're after a decent mid sized combi microwave, then take a look at the Sharp R890SLM - it won't let you down.